Below is a photograph of the Donor Kart. This was a kart I got a few years back, just to have and to mess around with later. Over the last few years I experimented around putting various more powerful engines into this racing kart. In the photograph below is the kart with a 100cc GP100 motorbike engine which gave plenty of ummph but terrible handling. I even tried to get the kart to take corners better by putting a heavy front bumper on the front of the kart to try and go round a few corners. However to no success, what so ever. 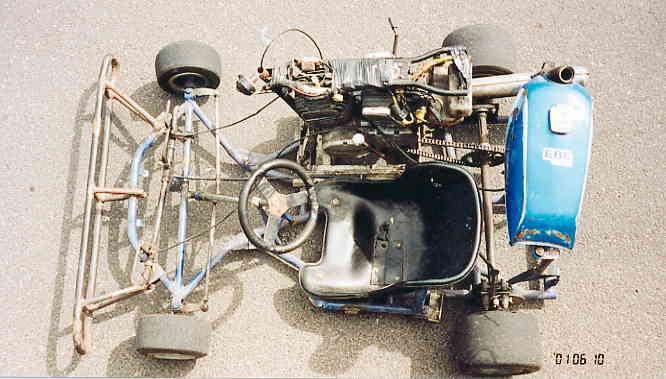 As you can see from the above photo the chassis has gone through a few rough times. As a result of the weight of the motorbike engine, the balancing of the kart was naturally enough disrupted, and this also added to the difficulty in handling. As a result of this and the lack of space left with this chassis I decided to make a new and improved kart with impeccable handling making the kart stick to the road and especially on corners.